Good morning! Today's nail art started as a random desire to do tortiseshell nails. I definitely did not have the proper polish "pieces" to make it happen though, so I started asking around to see if anyone could help me locate a brown jelly. I got a few thoughtful suggestions, but none of them were perfect for what I had in mind. Fast forward to a couple of weeks later, when I got a message from the lovely Lulu from Elevation Polish and I Dig Brown Nail Polish (how apropos!). She told me she had been playing around with some pigments and had created a brown jelly if I was still looking for one. I told her I absolutely was and I would love to try it out. 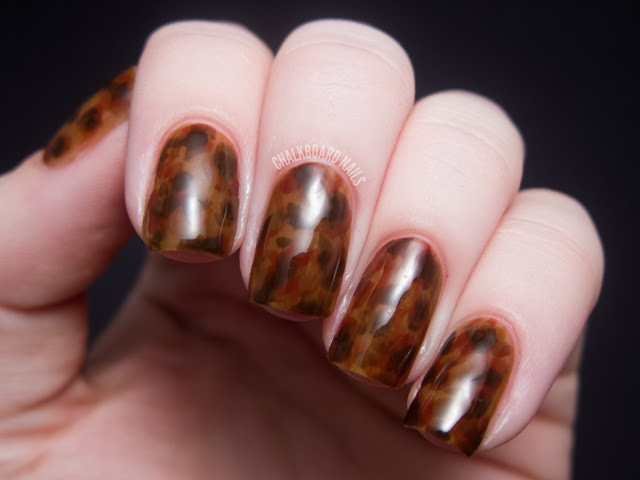 Little did I know that she would send me three amazing brown jellies in different shades, and that all three shades would be perfect in crafting my tortoiseshell manicure! The formula was fantastic on all of them and they applied beautifully. The jelly element is key in creating this look because it gives you the semi-clear almost-plasticy look that, say, tortoiseshell glasses would have. It also allows you to build different layers of depth that show through in different amounts. I made these nails by starting with a base layer of the caramel jelly. I then added some splotches of the brick-colored jelly, and put some of the dark brown jelly inside of those splotches. I took a nail art brush and added sections of the caramel color overlapping some of what I had done, and then added more of the brick & dark brown splotches. This layering method helped to create a good amount of depth. The final step was a healthy layer of topcoat, to finish the shiny plastic look. Unfortunately these shades are not being produced as part of the Elevation Polish line, but Lulu has plenty of other pretties to check out! 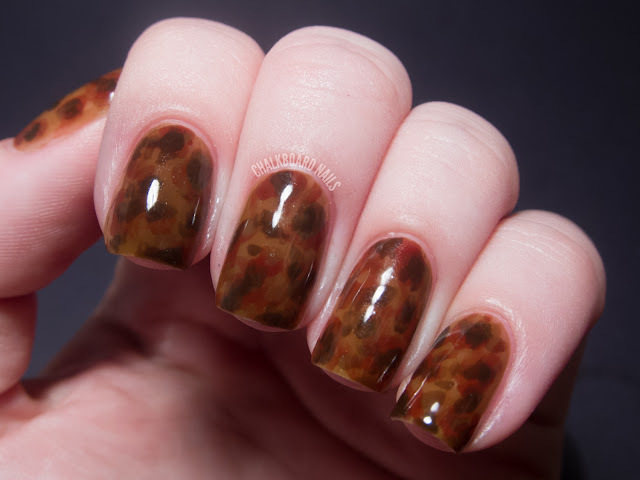 If you want to do this look yourself, you could try making your own jellies by mixing different brown polishes with clear. How very cool!! You got such a neat effect with all the layering. I think tortoiseshell glasses look so retro chic, wish I could pull them off haha. SHUT YOUR MOUTH, SARAH WAITE! This is AMAZING! These are so cool! You always have the best nail ideas! WOW!!! That looks really neat! I LOVE these! Looks gorgeous! and very unique too! This is so fantastic! I never would have thought of trying this, but now, I may have to! My eyes (@@) thank you! This is so amazingly cool!! Please, come do my nails so they match my watch, glasses AND sunglasses! This is awesome <3. Those are really gorgeous, the polishes are perfect for it, and you really nailed the technique. Beautiful! WOW! I don't know how you do it, but you do a great job! Though I'm not a fan of brown, your idea is simply amazing! Thanks for the inspiration! Wow that looks awesome!!! I normally avoid brown but that looks very chic and interesting. Great job! That is such a cool effect. Very plastic-y and authentic looking! I love this! I want you to paint my sunglasses!! You just get better and better! This is awesome! This looks really cool, great idea! I don't normally comment but these are beautiful!! Would match my tortoiseshell watch strap (if only I was artistic enough to recreate your nails)!! this looks so warm and the colours look so deep, great job! Your nail art is always so beautiful! this is absolutely amazing! is there anything you CAN'T do??? So awesome! These are dead on! OMG: I am just lovin this mani. It is just my thing! So beautiful! I bet it looks amazing in person! These are so pretty. I love them. Going to do them but never post other people's designs. This looks amazing! At first glance you'd think they were foils or something instead! Wow, I look at your nails, and I think of the combs I used to have as a kid for my hair.... I'll see if Nfu-oh has a jelly like this :) Great design! Gorgeous! This is so unique and beautiful! This is AMAZING!!!! The best effect i have ever seen. So unique. I don't think i would know where to start! Gorgeous!!! What a Wonderful idea :-) :-) Ya know for some reason, I never got into buying jelly-based polishes. But posts like this make me want to buy some!!! :-) :-) Looks Lovely!! Ugh- But I want them!! I have been on a hunt for basic color jellies with no glitter in them and these are perfect! Sad face. That came out really well! 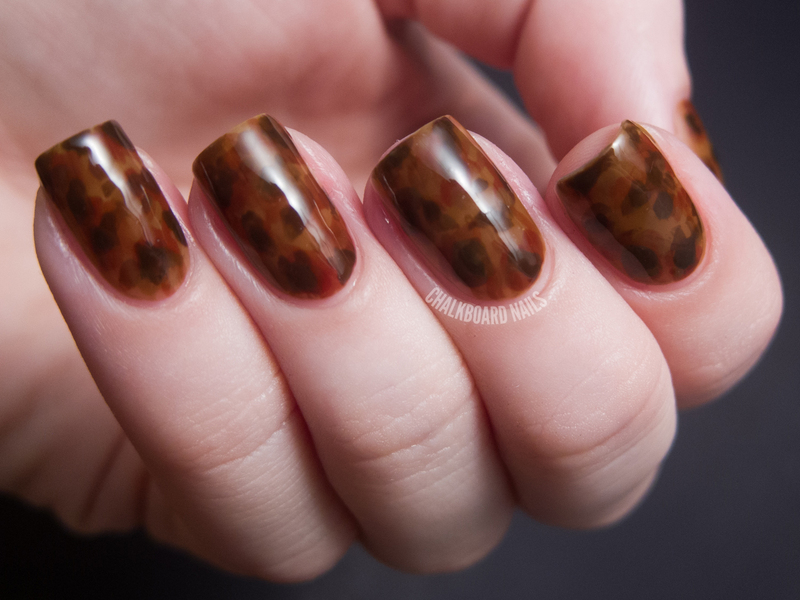 I love tortoise shell! I love the colors and the design! I've been looking for good brown jellies too! This is so freaking cool. You are my nail polish guru. This is really cool. I wish it's in youtube. They almost look like amber to! I am soooooooooooo jealous!!!! 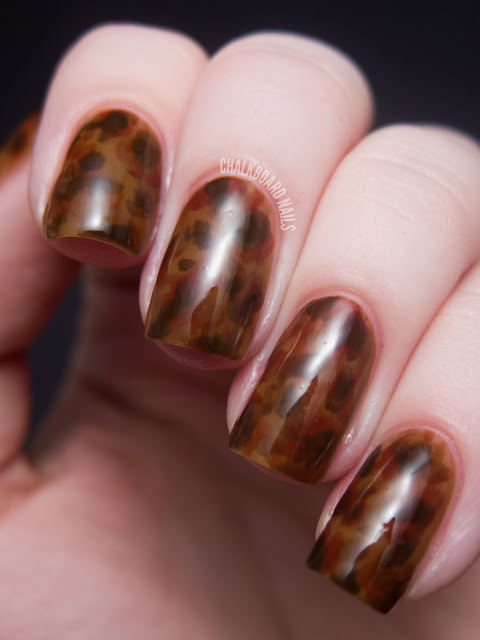 That is one GORGEOUS mani!!! This look is absolutely beautiful! Well done!